Did Rats Spread the Black Death? Everyone knows that black rats harboring fleas infected with Yersinia pestis (the bacterium that causes bubonic plague) were transported on ships throughout medieval Europe, spreading the Black Death and killing maybe half of the population. Right? Since Paul-Louis Simond proposed the idea in 1898, there’s mostly been agreement that rat fleas from black rats were the main vector of plague transmission. Many rodent species can be infected by the plague, and rodent species vary in their ability to tolerate the plague. For instance, mice and voles don’t tend to die when infected with the plague, while black rats are killed by the plague. 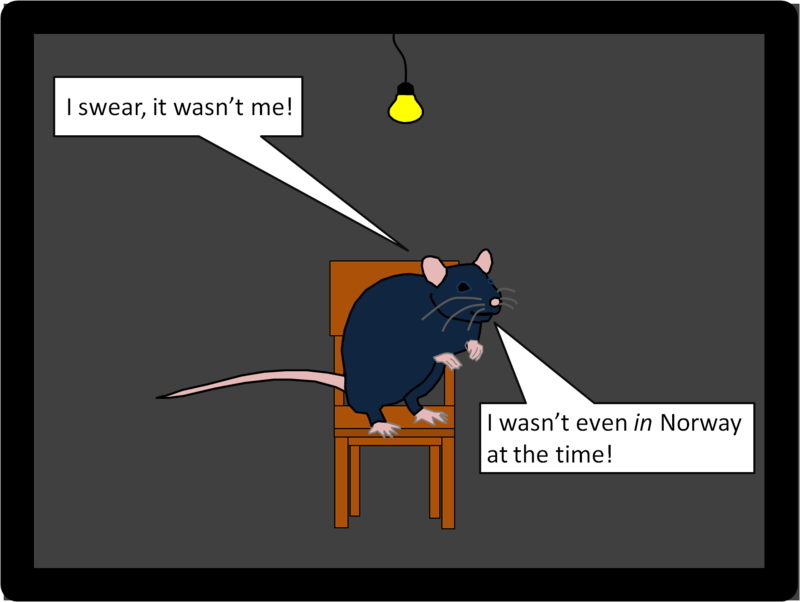 Apparently black rats don’t just quietly die, either – they get really sick and behave abnormally, so it would be hard not to notice the diseased rats. If black rats were experiencing a plague epidemic, then massive mortality events should have been observed in black rat populations. Therefore, if there are written accounts of plague epidemics in humans that do not include notes about how massive number of black rats also recently experienced horrific deaths, then black rats probably weren’t involved in the spread of the plague. Similarly, there should be archaeological records (i.e., rat bones) of black rat population declines coinciding with human plague epidemics. But in many cases, there aren’t! I find that fascinating! In many places, the plague spread so quickly that it does not seem possible that rats could have been the cause of transmission. The rats would need to travel to the new town and die of infection before the rat fleas left the rats to bite and infect humans. Apparently that process takes several weeks, which is just too slow to explain how rapidly the bubonic plague spread among towns. The human flea (Pulex irritans) can be infected with the plague. In present-day Tanzania, where the plague occurs in humans, human fleas are the most common fleas in households (Laudisoit et al. 2007). Furthermore, towns that frequently have plague epidemics also have greater proportions of houses containing human fleas. So, perhaps human fleas play(ed) a role in plague transmission? The human body louse (Pediculus humanus) can also become infected with and transmit the plague (Ayyadurai et al. 2010). Does that mean that rats and rat fleas never caused plague epidemics? Nope. There is evidence of rat plague epidemics before human plague epidemics in some locations. Similarly, the plague has proceeded slowly enough in some locations that rat-facilitated transmission is feasible. But in other places, like Northern Europe, the evidence may be iffy. Perhaps rat fleas originally brought the plague to the region, but then the main vectors were human ectoparasites? This is all fascinating, and I hope we see more related research in the future! Ayyadurai, S., F. Sebbane, D. Raoult, and M. Drancourt. 2010. Body lice, yersinia pestis orientalis, and black death. Emerging infectious diseases 16:892–3. Hufthammer, A. K., and L. Walløe. 2013. Rats cannot have been intermediate hosts for Yersinia pestis during medieval plague epidemics in Northern Europe. Journal of Archaeological Science 40:1752–1759. Laudisoit, A., H. Leirs, R. H. Makundi, S. Van Dongen, S. Davis, S. Neerinckx, J. Deckers, and R. Libois. 2007. Plague and the human flea, Tanzania. Emerging infectious diseases 13:687–93. This entry was posted in Uncategorized and tagged Black Death, flea, parasite, plague, rat by dinoverm. Bookmark the permalink. The speed of which the plague spread could be contributed to how bubonic plague could turn pneumonic, and then spread by coughing. Thus, the rats didn’t have to go from place to place, they just had to infect some people. But besides that, I’m out of counterarguments. Good job. I believe that the authors of the first study cited have since recanted. However, just how long does it take to travel by galley from.Kaffa to Genoa? If the contemporaneous chronicles were correct about just how quickly the disease kills (even in its least virulent form), how did anyone survive the voyage?, or suffient numbers of healthy people to man a galley, at any rate?How did the infections agent survive a trip by galley from Kaffa to Genoa without killing off the oarsman? Perhaps the virulence of Y. pestis has been somewhat overstated? Which authors recanted? I know there’s a recent high profile paper that also supports that black rats didn’t spread the plague, but I haven’t read it yet. However, just how long does it take to travel by galley from.Kaffa to Genoa? If the contemporaneous chronicles were correct about just how quickly the disease kills (even in its least virulent form), how did anyone survive the voyage?, or suffient numbers of healthy people to man a galley, at any rate?